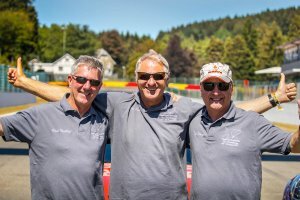 After an unforgettable week with 20 guest drivers at the Nurburgring and Spa, as well as spectacular dinners and socializing, my co-hosts, Tom Roberts & Ron Simons, and I sit down and debrief on what we all learned – the drivers and the three of us. Ron Simons is the RS of RSRNurburg, the leading provider of cars and instruction at the Nurburgring (as well as Spa and other European circuits). He’s been helping drivers experience The Green Hell for over 20 years, and has driven over 20,000 laps of what most drivers agree is the most challenging circuit in the world. Tom Roberts founded Euro Track Adventures a couple of years, when we partnered on our first experience of hosting a group of drivers going to the Nurburgring. Is there a transcript available? I’d rather read it than listen to it. No, just the audio for the podcasts.